Do We Deserve -- or Even Want-- More Jobs? I've been thinking about jobs and people's careers constantly for the past five years, and I started writing this piece when I was at the lake on vacation last week. Since Obama talked about jobs last night, I thought I would hit the publish key on this piece. 1. The sad state of employment in the United States. 2. The widening gap in work ethic between people of my generation (Gen-X) and that of the generation right behind me (millennials). 3. My drive to see the folks who work for me advance quickly in their careers. Coming up in the '90s, I heard baby boomers lament the work ethic of Gen-X. I'm self-aware enough to understand that I am, at 40 years old, doing the exact same thing to the generation after me. However, I think we are facing a three-generation trend in work ethic deterioration. When wondering why we don't have jobs in our country, perhaps we need to examine our work ethic. c) Millennials are not all the same. In fact, 25% are indistinguishable from Gen-X: They want to get paid, do their thing, not be micromanaged and be recognized for their accomplishments once and a while. I call these Gen-XYs at the office, and I LOVE these types. They have a healthy ego, they want to make money, they want to have a career and they want to, most importantly, work hard and make good stuff. They have the perfect balance of self-interest and selflessness. Many millennials not only don't want jobs, they simply don't deserve them. They can't take even a tiny amount of criticism and they need constant adulation for amazing efforts like, ummmm, showing up for work. A frequent refrain I hear from these folks is, "I've been working here for almost six months and you haven't recognized the work I've put in!" Of course my reaction to this is "Oh, I'm sorry, please tell me what you've accomplished." That is usually a short conversation which includes that the person came in and worked for the hours in which they were paid to work. In other words, they want the participation trophy. They want credit for coming to work for the hours they've been paid. That's not how it works in my mind, but I decided to relent. 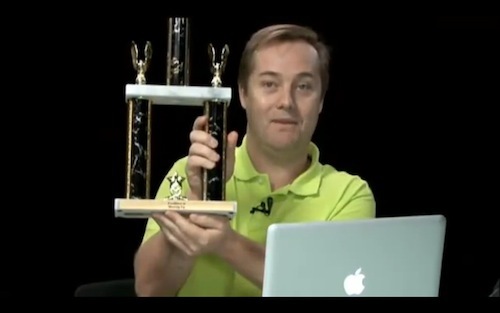 We have a tradition at the office of putting it on people's desks when they are on vacation so that they when they come back it's waiting for them as a reward for "excellence in showing up." The fact is, thanks to massive technological and organizational advances the “just show up” job is a seriously endangered species. Companies are getting so efficient that they've learned that they can make better and more profitable products and services with smaller teams. 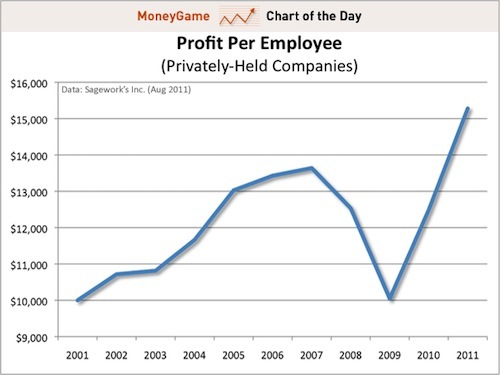 This chart from Safework Inc. (via BusinessInsider), shows that in the past decade the profit per employee has increased by -- wait for it -- 50%. What this chart tells us is that companies would rather hoard cash and increase their bottom lines by not hiring folks. Work-ethic erosion has sent a strong signal to the corner offices in corporate America: A large percentage of Americans are simply not worth the trouble. In fact, what I’ve learned -- and I know many of my contemporaries have too -- is that many folks simply don’t want a job. If a large percentage of folks don’t want to work hard and would rather be hiking around Machu Picchu, well, perhaps we shouldn’t worry about 10 or 20% unemployment. Maybe the future of America is that half our citizens don’t have jobs by choice? The "Four Hour Work Week" is a huge hit for a reason: it plays off the classic device of getting more by doing less. Tim Ferris is a frackin’ genius. Instead of fighting the trend like I am, he’s indulging it into a hundred million dollar franchise. The Gen-Y losers in this country want to explore and revel in the greatest accomplishments of mankind’s glorious history -- they just don’t want to try to participate in making history themselves. If you want to work four hours a week and work on some cause-based project, go for it. Just realize that while you’re spending your 20s mooching off the little value left in mom and dad’s house, which is massively underwater, you’re going to be screwed in 20 years. Your parents are going to be broke, 80 years old and burning off the last of their savings in a retirement home. You’re going to be fighting for work and taking care of them. You will be sitting with $100K in student loans for a graduate degree no one cares about and a resume that reads worse than a migrant worker’s while you read the "Four Hour Retirement" at the four-hour line at the unemployment office. The person I do feel sorry for? The 29-year-old John, with two kids, who came to read my gas meter today. His union just lost the fight against installing gas meters with cellular phones in them that automatically send readings to the home office. He and 799 other gas readers are going to be installing these new meters in Los Angeles in 2013, and after that their jobs disappear. They are to be reassigned to other parts of the company and then those jobs will be gone. I’m fairly certain the city is lying to them and will simply lay them off during the next budget crisis. Those folks are desperate to have a pay check and could care less about seeing some decaying artifact from a dying culture. Those are the folks I’m worried about because they are going to be really pissed off and with good reason: they work hard, believe in the system and just want to provide for their families. A permanent 20% employment situation could result in serious civil unrest. It might drive people to create a movement where people want to stop paying taxes, shut down the government, arm themselves to the hilt with weapons that are designed strictly for mass killings of other human beings and obsess over immigration. I blame it all on Tim Ferris. Seriously. “Well, if there is a way I could be put in a time machine and advance five years from now when you’re taking over the planet, I guess I would consider doing that. However, I’m torn because I really want to be part of fighting the good fight with you for the next five years.